There are a plethora of landscaping and construction companies here in the Lou, and all have different strengths. However, Quiet Village’s quality service and experienced team makes us stand out above the crowd. And when it comes to hardscaping projects like building retaining walls or laying patios and pathways, we shine. In order to turn your landscaping dream into a reality, our team will gather all the critical information. Give us a call, email us, or fill out our online design questionnaire to get the process started. Before your initial meeting with us, you will want to gather your plat of survey, house plans, and any ideas you have found in magazines, books or online. As part of your initial consultation, we’ll have a member of our team meet with you and take a look at your yard. We’ll brainstorm ideas with you and collaborate to enhance the beauty, functionality and sustainability of your yard wherever possible. We will also discuss the scope of your project and whether it requires a full design with a blueprint, which requires a design retainer (the fee will be credited towards the project if you decide to have it installed). Next, we’ll get started on your landscape design. As with all of our projects, it will be fully customized to your own tastes and needs. We will develop a professional, to-scale blueprint for your approval and encompass every intricate detail in our design, from planting and hardscape design, irrigation, grading and drainage layout, lighting, and more. After your landscape designer has created your blueprint (approximately two weeks after your initial consultation), they will meet with you again and present you with their design. They will walk you through the plan and explain how we will meet each design goal you set in the initial meeting. Our design will also show you pictures of the proposed hardscape and plant materials, as well as similar projects we’ve completed, so you can envision your finished project as clearly as possible. Finally, we will discuss the project estimate with you, answer any questions you may have, and make any necessary changes. If your hardscaping project requires any permits, fear not! Paperwork is no obstacle for the expert team at Quiet Village Landscaping. We will prepare any appropriate engineering and construction documents, fill out the necessary paperwork, and pay any permitting fees. This way, all the heavy lifting is done for you, and all you need to do is put the permit in the window once everything is approved! After all the permits are taken care of and your project is ready to begin, your landscape designer will pick out all the appropriate materials. Piece by piece, our expert team will bring your design to life, while at the same time ensuring that your project is up to code, structurally sound, and built to last. Once we are done, we always take care to leave the workplace clean so you can enjoy your new space immediately. Our number one goal for you is to provide the highest standard of service and build a space for you that you and your family will enjoy far into the future! Finally, we will stay in touch far after your project is complete. We don’t want to be a stranger to you, after all! 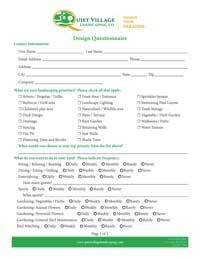 We can customize a maintenance program for you to ensure that your lawn and landscape remain in tip top share for years to come. And, our staff will always be available to answer any questions you may have and make regular plant health checks. At Quiet Village, we team up talented craftsmen with similar skills. That way we have several teams with different specialties, and they do what they’re good at. Our hardscaping team is a group of hand-picked experts who relish the work and enjoy working with each other. These team members gain additional experience through hands-on training with the latest hardscape technologies and materials. Rebecca, our landscape designer, obtained degrees in both landscape design and fine art. Her thorough training in both the technical and aesthetic sides of hardscaping gives Quiet Village a unique edge. Rebecca is very detail-oriented and she listens closely to our clients’ vision for each project. She develops a thorough understanding of both the needs of her client along with the site’s intended purpose. She has quite the artistic flair, going the extra mile to capture the style and personality of each home owner. We offer the widest selection of pavers, natural stone, and recycled materials and we buy from local vendors. Our landscape designer can advise what type of materials are best suited for the your outdoor living space. We provide quality materials that can stand up to the test of time so that you can enjoy your space long-term. We set very high standards for our work. Certified by the National Concrete Masonry Association, we hold ourselves to higher standards than merely the benchmarks of the industry. We are members of St. Louis Green, and we are driven by principles of sustainability so that our service is environmentally friendly. But the standard that we most strive to meet is that of our clients. Nothing pleases us more than hearing that a client loves our work. For example, Rebecca designed a patio and sitting area for a family in Central West End. The original patio was brick, but the home owners decided to give the space a fresh look by using natural stone. Rebecca incorporated the old brick into a border around the seating area to reuse the materials they had on hand, reduce cost, and most importantly, to incorporate something that would bring meaning and a sense of home. The family was very pleased. At Quiet Village, we are completely confident that we will not only out-perform our competitors, but we will meet your needs completely and uniquely. Set up a consultation and build something good that you and your family can enjoy for years to come.